Bingely Books rants or meals that you make at home for those that adhere to this diet. 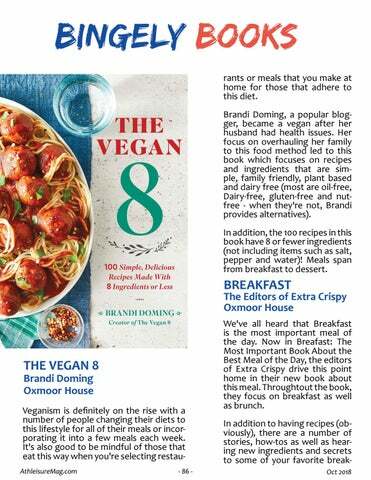 Brandi Doming, a popular blogger, became a vegan after her husband had health issues. Her focus on overhauling her family to this food method led to this book which focuses on recipes and ingredients that are simple, family friendly, plant based and dairy free (most are oil-free, Dairy-free, gluten-free and nutfree - when they're not, Brandi provides alternatives). In addition, the 100 recipes in this book have 8 or fewer ingredients (not including items such as salt, pepper and water)! Meals span from breakfast to dessert.